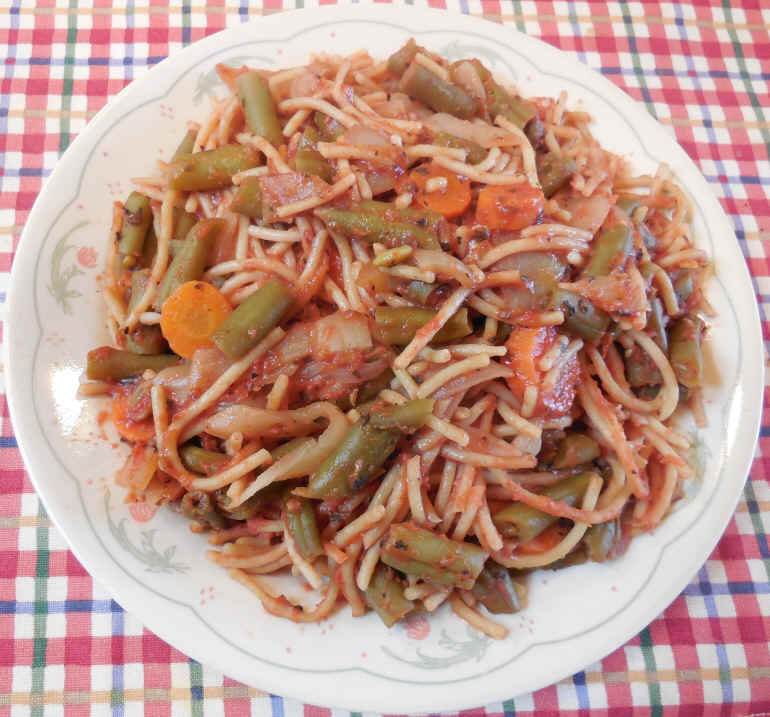 Spaghetti green bean pasta is a relatively easy to make vegan recipe that will serve six or more adults as a main meal. Preparation time is about 15 minutes, and cooking time is about 30 minutes, but since preparation and cooking times overlap, the total time should be about 30-40 minutes. Leftovers can be stored in a covered dish or container in the refrigerator for a few days without loss of flavor. Begin by putting the pasta pot on the stovetop with water and bring to a boil. While the water is heating, peel and dice the onions and put them in a covered microwaveable dish. Clean and cut the green beans and add to the covered dish, or add the frozen beans, add the seasonings, mix, cover, and cook until the onions become semi-translucent. When the water in the pasta pot begins to boil, add the whole wheat or other whole grain spaghetti, and mix until the water returns to a rolling boil, then turn off the heat, cover and let stand on the stovetop until the pasta softens to your liking; then drain the pasta in a colander and put back in the cooking pot and mix in the crushed tomatoes to keep the spaghetti from sticking together. When the veggies are cooked, mix in the tomato paste. When the pasta and veggies are cooked, mix together and reheat as necessary, and serve with a large tossed salad.